Iran says rescue operations have been ended in areas hit by a powerful earthquake at the weekend that killed at least 450 people and injured thousands. Television showed footage of rescue workers frantically digging through the rubble of dozens of villages immediately after the quake. However, officials say the chances of finding any more survivors are extremely low. President Hassan Rouhani will visit the area on Tuesday, according to state TV. Sunday’s 7.3 magnitude earthquake struck villages and towns in the mountainous area of Kermansheh province that borders Iraq. At least 14 provinces in Iran were affected. 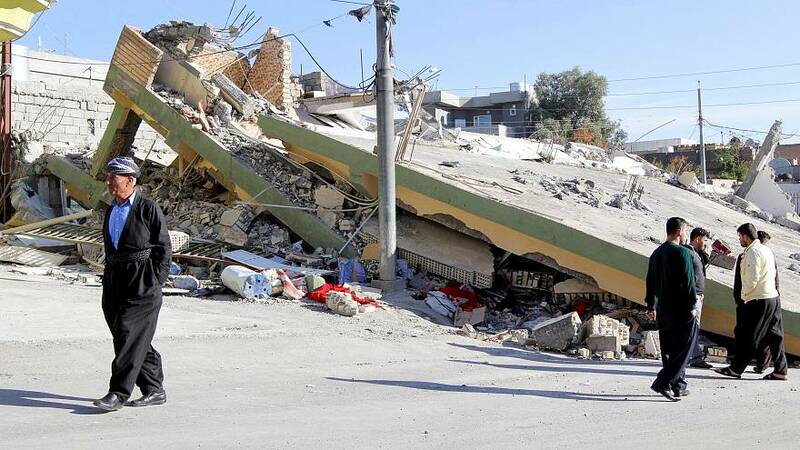 The quake, centred in Penjwin in Iraq’s Sulaimaniyah province in the region of Kurdistan, killed at least six people in Iraq and injured more than 68. In northern Iraq’s Kurdish districts, seven were wounded and 325 killed. Many people were asleep at the time. What about those who survived? Hundreds of critically-injured people have been dispatched to hospitals in Tehran. State television says thousands are huddling in makeshift camps. Many have spent a second night in the open. Iran’s Red Crescent says emergency shelters have been put up for thousands left homeless. However, lack of water and electricity as well as blocked roads in some areas hindered aid supply efforts. More than 400 people were killed and almost 6,500 others injured after a 7.3-magnitude earthquake struck near Iran’s border with Iraq. What about the official response? Iran’s top authority, Supreme Leader Ayatollah Ali Khamenei, offered his condolences on Monday. He called on government agencies to do all they could to help those affected. Iranian police, the elite Revolutionary Guards and its affiliated Basij militia forces were dispatched to affected areas on Sunday night. Are earthquakes unusual in the region? No. Iran is crisscrossed by major fault lines and has endured several devastating earthquakes in recent years. A 6.6 magnitude quake in 2003 reduced the historic southeastern city of Bam to rubble and killed an estimated 31,000 people. “The rescue operations in the (western) Kermanshah province have ended” – Pir-Hossein Kolivand, head of Iran’s Emergency Medical Services said on state TV. “It is a very cold night..we need help. We need everything. The authorities should speed up their help,” – a homeless young woman in Sarpol-e Zahab, one of the hardest-hit towns. water and shelter,” governor of Qasr-e Shirin Faramarz Akbari told state television. “More people will die because of cold. My family lives in a village near Sarpol-e Zahab. I cannot even go there. I don’t know whether they are alive or dead,” – Rojan Meshkat in the Kurdish city of Sanandaj. Dreadful news coming out of Iran and Iraq. Our thoughts and prayers are with all those affected by the earthquake. Europe should mobilise all available humanitarian assistance. Instead of threatening to bomb Iran & renegotiate the nuclear deal, we should be sending them aid & offering them help as they deal with the earthquake.